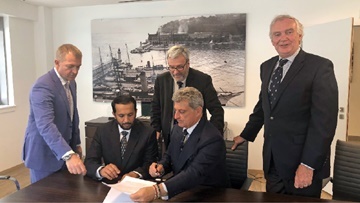 MONACO: DP World Group subsidiary P&O Marinas – manager of the Mina Rashid Marina project in Dubai – has finalised an agreement with Société Monegasque International Portuaire (SMIP) in Monaco to work on selected superyacht marina projects in the Mediterranean and around the world. A Memorandum of Understanding (MoU) was signed in Monaco in May. Mina Rashid, a project aimed at ultimately accommodating 20,000 yachts, opened last November with the first of three phases, Marina Cube. This is expected to be a new maritime tourist and entertainment hot spot stretching over 13km² (5mi²).